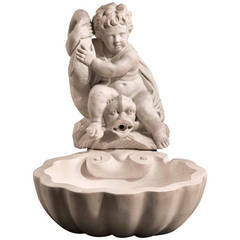 From Italy, this elegant wall fountain has been made from carved marble. The upper portion has a shaped and molded outline with C-Scrolls, while a large floral motif on the interior, outlines the opening for the spout. 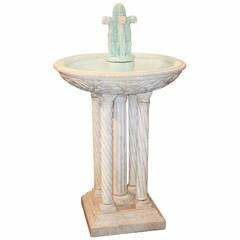 It sits on a deep basin that has canted corners and a carved cartouche at the center. 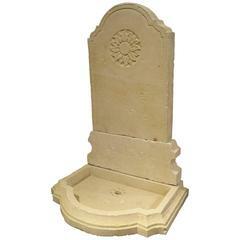 A shaped lower pedestal holds the upper marble sections. In addition to being used as a wall fountain, it can also be used as a beautiful sink in a powder room. 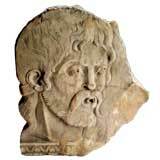 Very good strong condition with minor chipping and losses. Slight coloration differences throughout. 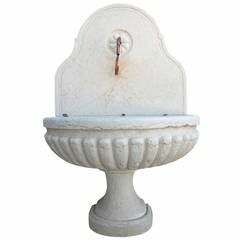 A very finely carved Italian Carrara marble wall fountain with basin.